A.B. Borisov is a world known theoretical physicist, an Associate Member of the Russian Academy of Sciences (2011), Dr.Sc. in Physics and Mathematics (1988), Professor (1989). He was born on August 2, 1947 in Sverdlovsk. In 1973 he graduated from the Physics and Technology Department of the Ural Polytechnic Institute. From 1973 to 1975 he worked as a research assistant at the Theoretical Physics Laboratory, hosted in the Joint Institute for Nuclear Research (JINR Dubna, Moscow region). During these years, he together with V.I. Ogievetsky showed that the theory of gravity is the theory of spontaneous breaking of affine and conformal symmetry groups and gravitons are Goldstone particles; established a profound relationship between the theory of gravitation and the theory of nonlinear realizations of internal symmetry groups, in particular, the chiral dynamics. The results became the theme of his Candidate’s thesis (1978, Dubna). After returning to Sverdlovsk in 1975, he started his career at the Institute of Metal Physics as an engineer. His scientific activity area covers the theory of solitons and theoretical study of localized structures in condensed matter physics. Currently, A.B. Borisov is heading the laboratory of the theory of nonlinear phenomena and is one of the leading Russian experts on nonlinear phenomena in condensed matter physics. In soliton theory, he has developed a method of the inverse scattering problem and the dressing method for integrable models with the elliptical Lax pair. The latter technique underlies the prediction and description of solitons in magnets in terms of the macroscopic hydrodynamic equations. These findings extend the soliton concept to a wide class of quasi one-dimensional magnetics. A procedure proposed by him jointly with S.A. Zykov to multiply integrable equations allows a new integrable model to be built through a pre-assigned integrable model. Applying the technique of differential geometry to nonlinear equations to integrate, A.B. Borisov has been the first to classify spatially inhomogeneous structures in the chiral SU(2) model (the Andreev-Marchenko model in an exchangeable one-constant approximation) and to describe completely threedimensional structures in a wide range of magnets. Among them, of particular interest are: cnoidal hedgehogs, localized sources, stationary two-dimensional and three-dimensional magnetic spirals whose structure was known earlier only for active dissipative media, etc. A part of the results obtained is confirmed experimentally. In collaboration with F.N. Rybakov he has predicted and examined static and dynamical three-dimentional topological structures (hopfions) with finite energy with nonzero Hopf invariant in magnets. They have succeeded in predicting and confirming the existence of spiral lattices in helimagnets as well. In their theoretical research, they have thoroughly set forth a three-dimentional structure of chiral skyrmions and their lattices in cubic helimagnet films, as well as physical mechanisms responsible for the stability of the skyrmion lattice over a large range of external magnetic field values. A.B. Borisov is a member of the Joint Scientific Council on the physical and engineering sciences of the Ural Branch, a member of a specialized doctoral Council of the Institute of Electrophysics of UB RAS. 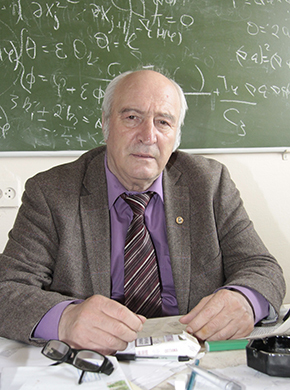 Since 1989 he has taught students as a professor of Theoretical Physics and Applied Mathematics Department at the Ural Federal University. He has trained 3 Dr. Sc. and 4 Cand.Sc; an author of 135 scientific, learning and teaching works, of 5 books. Among them are: the higher complexity textbook “The Foundations of Nonlinear Dynamics” for undergraduate and postgraduate students of physical faculties and the two-volume monograph “Nonlinear waves, solitons and localized structures in magnetic materials” (jointly with V.V. Kisielev).